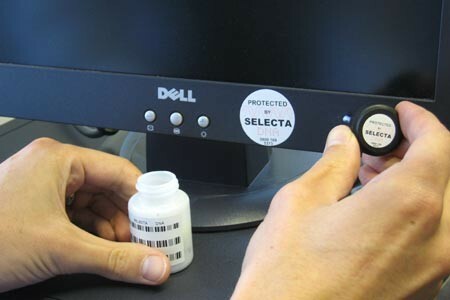 SelectaDNA is a unique theft deterrent which for maximum effectiveness, provides a combined microdot and true DNA tagging security system for marking and identifying your property. Used in conjunction with the warning and window stickers supplied, the system will help prevent the theft of all the expensive items in your home or work place. SelectaDNAcomes in a pot of adhesive glue to apply to any valuable items of property. Once applied, removal of all the SelectaDNA from a marked item is almost impossible, as it is difficult to locate (except with a UV lamp) and remnants of the DNA will easily remain in corners and uneven surfaces. The DNA code along with the customers details are held on our secure LPCB approved database thereby allowing recovered property to be traced back to its rightful owner after analysis - even a tiny molecule of glue can be used to determine who the item really belongs to. SelectaDNA can be used to mark all types of valuable assets such as: Computers, Laptops, PDA`s, Printers, Scanners, Projectors, Televisions, DVD Players, VCR`s, Games consoles, Stereo systems, MP3 Players, Personal stereos, Antiques and Paintings, Power tools, Lawn mowers, Other garden equipment, Industrial machinery, Scaffolding components ... and any other items of value which might be at risk. -Product options available for different applications. Each pot of SelectaDNA has a unique formulation which can be spectro analysed in the forensic laboratory with 100% accuracy to quickly identify the true owner of the marked goods.